The Note pane is full-size and the Controllers pane is hidden at the bottom. Drag the gray splitter bar up to display the Controllers pane. The duration of the notes will affect the thickness of the line of the velocity, therefore, affect the quality of the patch. You want to use the pencil to modify the notes and the lines. Warning: It is not suggested using this tool since it requires heavy resources. Use Pencil tool instead. Change the start time Drag the left edge of the note in either direction. The note duration stays the same, but the start time is shifted. Change the pitch Drag the middle of the note up or down. Change the duration Drag the right edge of the note in either direction. Draw a custom curve indicating changes in controller value. Draw a straight line indicating a steady increase or decrease in controller value. Erase controller changes already in place. Press and hold the left mouse button in the Graphics window. Overture displays a vertical line and plays any notes that are underneath the line. 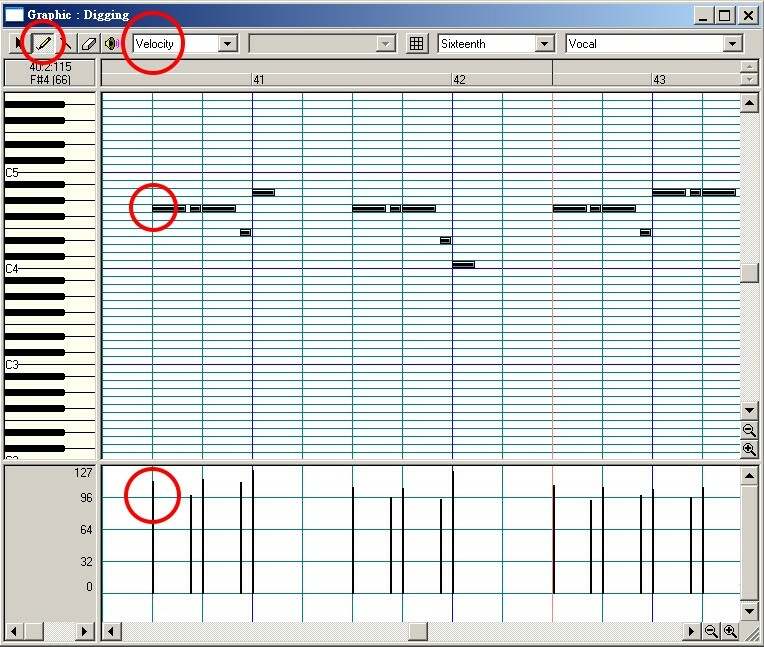 The Controllers pane, the lower half of the Graphics window, lets you edit MIDI, controller, velocity, and pitch wheel data. MIDI hardware and software use controllers, special types of events, to control the details of how MIDI music is played. They use automation data to adjust volume, pan, and other parameters of MIDI and audio tracks on the fly while playback is in progress. Overture lets you enter or edit controller and automation data using the Controllers pane in the Graphic window. Controllers are the pedals, knobs, and wheels on your electronic instrument that you use to change the sound while you're playing. For example, a sustain pedal and a modulation wheel are two controllers commonly found on keyboards. The Graphic window toolbar contains two drop-down lists, Data type and Controller, that let you choose the controller or data you want to see and edit. The contents of these lists depend on the port and channel settings and on the instrument assigned to that port and channel. Different instruments use controllers in different ways. Overture lets you use instrument definitions to define the names that go with each controller number. A MIDI keyboard responds in two ways to the player's touch on the keys. The first is velocity sensitivity. The faster the player presses a key down, the higher the velocity data produced. To the player, it feels like he or she is playing the keys harder, not faster, but the result is the same. The velocity data is most commonly used to increase the level of the sound with harder playing, and also to increase the brightness of the sound, as would happen in an acoustic instrument. Once a key is played and held down, there is also 'aftertouch', more properly known as 'pressure'. The player can exert more pressure on the key while it is down; this data is used to control typically a vibrato effect, level or perhaps brightness - it depends on how the tone generator is programmed. But aftertouch or pressure works in two ways. One is 'channel pressure', where the keyboard senses the pressures of all of the keys held down and generates one set of data to cover them all. Usually this is the pressure of the hardest-pressed key. So with channel pressure, you couldn't press one key hard and another gently and get different results for each key. Channel pressure covers the whole of the keyboard (or the whole of one MIDI channel). Polyphonic pressure or aftertouch however works on individual keys. So all the subtleties of your playing are maintained, and if this data is used to control vibrato, then each note held down can have a different amount of vibrato. The problem with polyphonic pressure is that it generates a tremendous amount of data. Even channel pressure generates a lot because it constantly changes. A pair of note-on and note-off messages comprises a mere six bytes, but channel pressure varies every time the player changes pressure on the keys. Polyphonic pressure multiplies this data by up to ten (ten fingers!). The standard MIDI system can only transmit about 30 kilobits of data per second, and polyphonic pressure can easily push against this limit. Try adding more data, such as additional channels, and the whole of the MIDI data stream will slow down.